In Contact Report 34 (September 14, 1975) Semjase explains to Meier that Bermuda Triangle is a place where under certain circumstances a natural portal to other worlds in other dimensions forms. At the end of Contact Report 38 (November 13, 1975) Meier asks Semjase about the world in the other dimension. Semjase explains that there are many dimensions and many worlds and it would be too much to describe them all, but she mentions a dimension where 3 worlds exist: a primeval world, a world covered in a mantle of vapor and a world quite similar to Earth. According to Semjase, due to the dangerous close pass by of Venus with the Earth 3,500 years ago, the two planets in two different dimensions (primeval planet and the “fog” planet) have been dragged into a totally different dimension of the fully developed Earth-like planet. In the same CR, Meier says that he would like to photograph these worlds, and Semjase says they could visit this dimension on a short notice. A few weeks later, on December 3, 1975 as described in Contact Report 39, Meier allegedly made the promised journey into the other dimension with 3 worlds, together with the Semjase and her father Ptaah. First they visit the primeval world on which dinosaurs live, and Meier has the opportunity to make photos on this world. After that they visit the third world and it’s moon (the middle world, which contains a lot of oxygen, is not visited). According to Semjase the people on this world live approximately 500 years into the future. However, earlier in the contact report Ptaah (CR 39, Ptaah verse 10) said that the people on this world are 870 years ahead of us (in the earlier editions of Semjase Kontakt Berichte 1st & 2nd eds. this was 470 years, perhaps this is an error in the PPKB 2 edition) and have beamships. 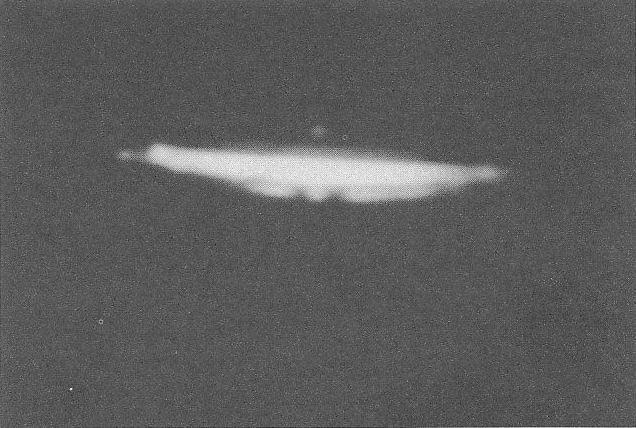 In PPKB 2 on page 39 the following two pictures are included which Meier allegedly made of the beamship(s?) from other dimension. 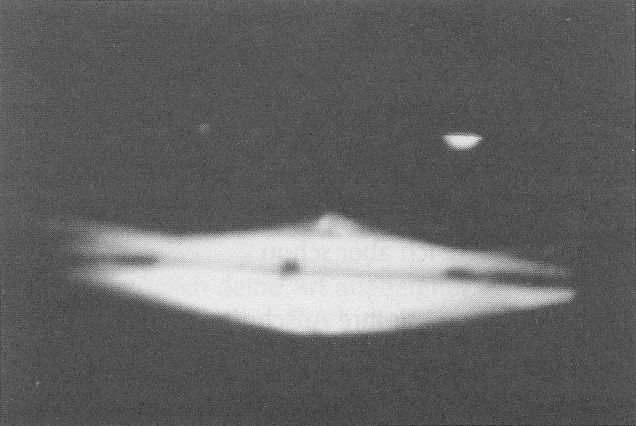 These pictures are a part of the collection of 42 space photos of which around 2001 ‘it was strictly ensured, with the help of Ptaah, that it only concerned “Billy’s” genuine pictures or his pictures that were only slightly falsified’. 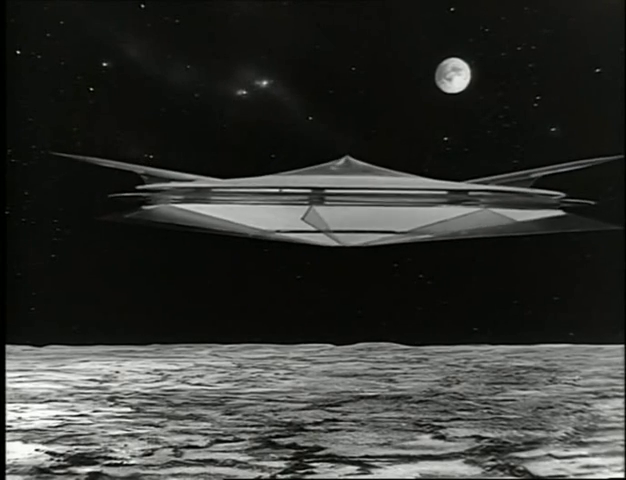 So according to Meier/Semjase, the creators and artists of the ‘Raumschiff Orion‘ science fiction series received impulses that inspired them to design the model ship for their TV show. It is hard to deny that science fiction literature, films and series (ex: ‘Raumschiff Orion‘) play a significant role in inspiring and educating people with concepts like space travel, new technologies, other worlds, extraterrestrial life, etc. Starting from the premise (Semjase’s argument) that advanced extraterrestrial try to slowly educate us and have the ability to send telepathic impulses with ideas and/or images of their technology, space ships etc., it is not antithetical to the premise, that the creators and artists of a series like ‘Raumschiff Orion‘ would also have received those impulses, which resulted in their representations of the supposedly real ET spacecrafts, albeit from another dimension. The real craft in Meier’s pictures would then of course look like their fake counterparts. Naturally a spaceship could be photographed from any angle and direction, with any foreground or background with or without additional objects in the same picture, so it would be extremely unlikely for Meier’s pictures to match frames from the TV series if they are authentic. The first picture seems to match reasonably well with a frame (flipped horizontally) from the intro (also see this animation). Notice the white ‘bands’ on the underside of the ship (short on the left, long one on the right), which are also visible in the frame. Also in both the picture and the frame the top dome is only partially visible. The second picture is similar to a frame from Episode 5 (see animation), the bright spot and the circular segment above the ship in Meier’s picture match well with the galaxy (lower-left) and the full-moon visible in the TV frame. Furthermore notice the shape, location and extent of the dark parts on the rim (middle section) of the ship in Meier’s picture which are similar to the features on the ship from the TV frame. The relative positions and sizes of these different elements also match very well with Meier’s picture. This suggests it’s very likely Meier’s picture was actually taken from the frame, even though the top part seems to have been cut-out/cropped as only the lower-left bright spot and a part of the moon are visible in Meier’s picture. Technically, it cannot be disproven that Meier’s pictures are authentic pictures of real spacecraft, yet the fact that they match frames from the TV series, regarding perspective, features and relative positions and sizes of the objects in the pictures casts severe doubt on the authenticity of these pictures to say the least. The chances of Meier’s pictures being authentic AND very similar to frames from the TV series seem astronomically small. We have investigated two of Meier’s pictures of which it is suggested that it is part of a collection of 42 space pictures that were verified and authenticated by the Plejaren Ptaah as either genuine or only slightly falsified. These pictures allegedly show spacecraft(s) belonging to a human race from another dimension who are about 500 years ahead of us. 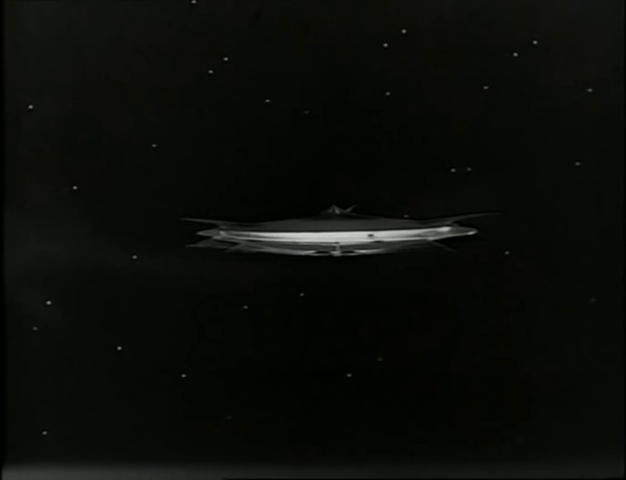 As described by Meier himself, these ships are very similar to the model ship from the German science fiction series ‘Raumpatrouille – Die phantastischen Abenteuer des Raumschiffes Orion‘ originally aired on TV between September 17 and December 10, 1966, which later also had several reruns. The explanation given for this is that the creators/artists were inspired through impulses to prepare and familiarize the Earth humans about concepts like space travel, extraterrestrial life, etc. Although technically this cannot be falsified, both of Meier’s pictures match frames from the aforementioned TV series, which suggest that these pictures most likely have been taken from the TV show.